You are here: Home | Should Visitability Be A Federal Law? Should Visitability Be A Federal Law? Barbara Manning is a freelance communicator who uses dynamic words and images to communicate clear and convincing messages in web, print, and interactive media. Could Visitability Be More Important Than Healthcare? According to the United Cerebral Palsy’s State of Disability there are 54 million people living with disabilities in America. The United States has a generally aging population; 2005 Census statistics indicate that there are 78.2 million aging Baby Boomers in America. At any time, an individual can develop a temporary disability. Unintentional falls are in the top ten of the list of injuries leading to an emergency room visit or hospitalization. What can an individual do after breaking a leg if they live in a home with the bathroom on the second floor? They can seriously limit their fluid intake and only use the bathroom once or twice per day. What does an individual do if they break a hip? Every year, thousands of Americans face this same question. It is not enough for disability advocates to argue for Visitability on a state-by-state basis. Visitability must become a national priority. Too often individuals become prisoners in their homes because they can’t safely navigate the steps. Visitability could liberate millions of people living in isolation from their friends, neighbors, and communities. The Americans with Disabilities Act requires access for people with disabilities for all new multi-family dwellings and a small percentage (5%) of single-family homes constructed using public funds. This law obviously does not address the vast majority of single-family housing in the United States. Just making these three changes in the design of new homes is a cost-effective way for people to maintain their independence. Most people living with a disability will tell you that their biggest issue is living in a world that does not consciously accommodate their needs. A lack of easy access denies those who need it opportunities to interact, socialize, create, and enjoy friendships. For people with disabilities and the elderly, options are available to help make a dwelling accessible, but these are costly and time-consuming. Constructing an accessibility ramp in Northwest Ohio can currently cost as much as $5,000 with the cost of labor and materials factored in. Installing a residential wheelchair lift onto a home can cost the homeowner between $3,400 and $6,500. If an individual lives in Northwest Ohio and can’t afford to construct a ramp, or install a lift, they may be waiting on a list for 18 months for a social service agency to meet their needs. Entering a nursing home may be an option. According to the Center for Disease Control and Prevention, there are 16,100 nursing homes in America with 1.7 million beds and 86% occupancy. The number of current residents in 2004 was 1.5 million and the average stay was 835 days, a little over two years. If individuals are only staying in nursing homes for little more than 2.5 years, where are they going? For the most part, they are returning to homes that do not meet their needs. Individuals spend years residing in homes with dining rooms or living rooms converted to bedrooms, using portable commodes, and undergoing sponge baths. Is this how anyone wants to spend his or her life? Designing homes with open floor plans, U-shaped kitchens with maneuvering space for food preparation, bathrooms with reinforced walls that support the installation of grab bars can add value for everyone, not just the elderly and people with disabilities. In March 2009, Representative Jan Schakowsky re-introduced the Inclusive Home Design Act (HR 1408) to Congress. For new homes built with federal assistance, this bill supplements the existing 5% requirement of fully accessible units by mandating visitability in all of the other units. If this bill becomes law, it will make subtle, but substantial changes in how America constructs new homes. 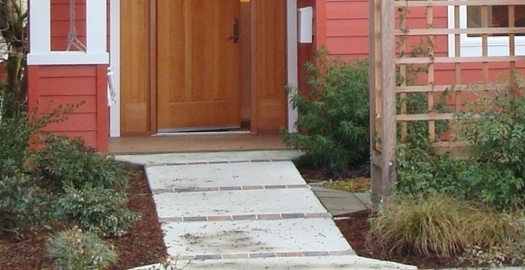 Visitability is an important strategy for developing accessible housing. It can contribute to creating neighborhoods and communities that welcome everyone. There is a huge market of 78.2 million Baby Boomers who may soon need affordable and accessible homes. Next PostHey- I Know That House! How Does Broadband Affect Aging in Place?